Did someone call a doctor? There isn’t any doctor around, so we hope that at least you can help our poor Baby Boo, because it looks like she has had an accident and her foot hurts. It looks like it needs some cleaning, some stitches and someone who knows how bad it is. 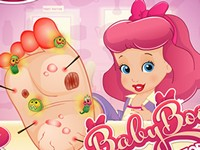 Join in these fun doctor games for babies and help our little girl get her foot healthy again!